Relegation-threatened Ripon City are hunting for a goalkeeper again after number one Matt Shaw was ruled out for the season. Shaw has suffered a cruciate knee ligament injury and has been told to avoid playing football for nine months. He first sustained the injury before Christmas but was cleared to make a return for the West Yorkshire League Division One side against Leeds Modernians last week. However, he aggravated the damage in the 5-3 defeat and had to sit out Saturday’s 3-2 defeat at Aberford Albion. Assistant boss Dan Metcalfe filled the void but he admitted the club were desperate to find a long-term solution between the sticks. Metcalfe said: “It’s a big loss to lose Matt but he has been told he is out for the season. He’s done quite a bit of damage to his knee. Metcalfe was City boss Micky Baldwin’s shot-stopper for the reserve team last season and has made six appearances since the duo took over the first team this season. But he could do nothing to prevent City falling deeper into the relegation mire after twice conceding a lead at Aberford at the weekend. Danny Edmunds tapped home from close range to City ahead in the first half but the hosts equalised with a similar effort close to half time. The momentum looked to have been with Ripon when substitute Jamie Stewart fired them back in front. But Albion netted twice in the final 20 minutes to turn the tables and deny City a much-needed point. Baldwin’s side are now five points adrift heading into a tricky run of fixtures. City welcome fellow North Yorkshire side Sherburn White Rose to Mallorie Park on Saturday before trips to Hartshead and league leaders Stanley United. Metcalfe added: “If we don’t get points on the board soon, it won’t be in our hands. Meanwhile, Boroughbridge surged to the cusp of the promotion places with a second consecutive 2-0 win at Aldborough Road. 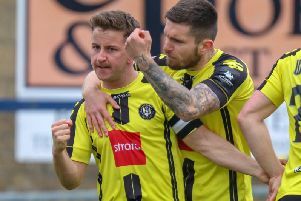 ’Bridge picked up where they left off the previous weekend as Daz Simpson got the scoring underway in the 10th minute, before Jimmy Tucknott fired home late on to make sure of the points. Daz Ekin’s men climbed up to fourth in the Division One table, just one point off third and four off second but having played more games than those sides around them. ’Bridge’s second string were beaten 2-0 by an unbeaten Oxenhope Recreation Reserves.